I love canals. Not boating on them, as I'm not a great lover of being on water. I love being beside them, and to appreciate the skill and endeavor that went into building them. I was brought up in a small village in North Wales just a few miles the other side of the mountains from Llangollen. 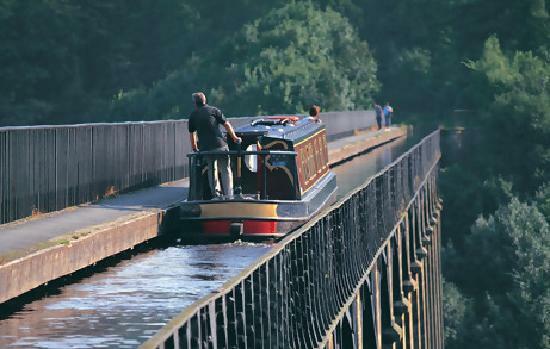 Many tourist books have said that the Llangollen Canal is probably the most beautiful canal in Britain. It is 41 miles long, and leaves the Shropshire Union Canal just north of Nantwich in rural Cheshire. It climbs through deserted Shropshire farmlands to cross the border into Wales near Chirk. It then cuts through increasingly hilly countryside to finish alongside the River Dee tumbling out of Snowdonia, just above Llangollen. The magnificently beautiful stretch in the Vale of Llangollen between Chirk and Llangollen was awarded World Heritage Site status by UNESCO in 2009. Many times growing up we would walk from the village through narrow country lanes to the top of hills called the Panorama. You looked down over the Vale of Llangollen, with views of the River Dee and Canal below. We would walk along the hilltop until we came to Castell Dinas Bran (Crow Castle); climbing up to the ruined castle and down the other side to the town of Llangollen, with its welcoming ice cream and tea. You crossed over the canal to get into the town. In the Summer the place was packed with visitors, many of whom enjoyed a couple of hours on the water, either on a boat pulled by shire horses, or on hired motor barges. Many others just enjoyed walking beside the canal in the tranquil beauty of the area. One of the most spectacular parts of the canal is the Pontcysyllte Aqueduct. 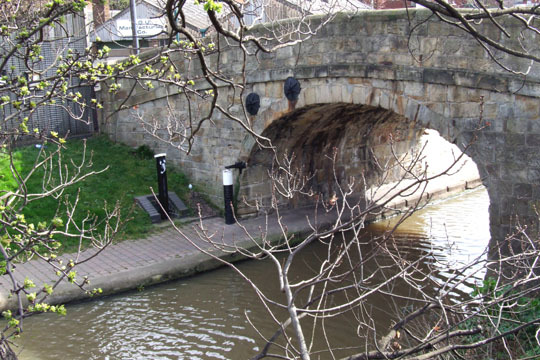 Built by Thomas Telford and William Jessop, it was one of the first designs to use cast iron troughs to contain the canal. The trough is exposed and sits 120 feet above the ground on slender masonry towers. Being a wuss from birth about heights, I never had the courage to walk across the Aqueduct. I may not be alone, for one travel writer said, "When you cross it by boat there is an exhilarating sheer drop on the non-towpath side. You should stay below decks if you don't have much of a head for heights, but do try and look through the windows, otherwise you will miss some amazing views". The views are truly magnificent. Imagine my delight on moving to Nottingham to find a canal within a mile of my door. Granted that it comes nowhere near offering the spectacular vistas of the Llangollen Canal, but it is of interest none the less. The link between Llangollen and Nottingham is that William Jessop was responsible for the design of both canals. The Nottingham Canal was opened in 1796, and was a nearly 15 mile stretch between Langley Mill in Derbyshire and Nottingham. It cost £80,000 which was nearly twice the original budget (there's nothing new about capital projects going over budget is there?). The canal's working history was not particularly long, and it was abandoned in 1937. Today, the northern section is a nature reserve, and the southern section (thankfully for my interest) is part of the River Trent Navigation, and is busy with leisure boats particularly through the Summer months. A lot of money has been spent improving the boating and walking experience along this southern section. 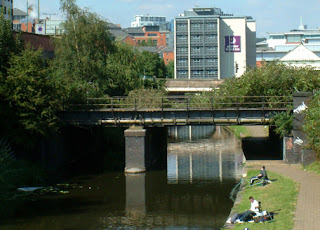 ﻿ Let me take you on a walk from West Bridgford along the canal to Nottingham City centre. The canal at its southern end begins at the River Trent, opposite the Nottingham Forest Football Club. 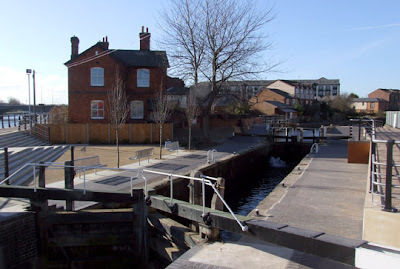 The access is the Meadow Lane Lock pictured above. This has been recently renovated with pedestrian access much easier, and better facilities for those with boats. It is a mile walk to the Carrington Street bridge according to the sign post. The canal walk starts with Turneys Quay on your left. Originally this was a huge leather dressing works that you could get to by canal, river and road. Some years ago the site was turned into quality housing and apartments. You pass under a beautiful stone footpath bridge, pictured above, at Iremonger Road, which leads to Meadow Lane. This is the oldest bridge on the canal, and it's best to appreciate it, as the other bridges are functional rather than beautiful. On your right you pass Notts County Football Club, the oldest football club in the football league. 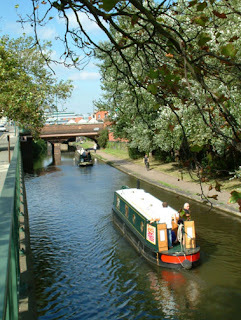 The canal follows the line of London Road for the next half mile, but though the road is a busy one, the noise of traffic does not spoil the enjoyment of the canal walk. Patient fishermen vie for the waters attention with boats, mallards, coots and the occasional geese. Walkers on the towpath just need to watch out for joggers and cyclists. The canal boats range from the very old, which are either cared for or not particularly cared for, to the very new with every mod con. Sailors either own the boats and permanently live on them or occasionally sail them, or they rent them for a holiday. Most seem to have TV or satellite Aeriel's, which for those who are part time sailors I cannot understand. For me, part of getting away, includes getting away from the TV. Perhaps my addictions lie elsewhere. Walking further along the canal, you come across the old Great Northern Railway Station building which I believe was closed in the 1930's, and has now been converted into a Virgin Active Health Club. Thankfully the exterior has been kept intact, and is beautiful. At the Great Northern Close road bridge, you have to leave the canal, cross over the bridge and get down to the other side of the canal to continue the journey. However, this is as far as I go on this canalside walk, and the rest of the journey can wait for another blog. When you cross the bridge to the other side of the canal at the bottom of London Road, there is a viewing platform with seats that I like to sit on. The platform was built in 1997 on the former site of the Great Northern Railway London Road High Level Station. Sitting there you overlook a canal basin where boats can turn if they wish to. You sit beside the Premier Inn; on your right is the NHS Walk in Health Centre and also the BioCity complex; behind the Premier Inn is the BBC headquarters; to the left is Jury's Inn and Station Road leading to the Railway Station; directly ahead you can see the beginning of the Lace Market district, with the tower of St Mary's Church just visible (this is one of the oldest and most beautiful churches in Nottingham). In view is also the Ice House, which is alongside the Capital FM Arena (formerly Trent FM), and the home of Nottingham Panthers Ice Hockey team. My goodness, it's only really just struck me how much can be seen from this viewing platform. My walk is ended for the day, and the canalside has not disappointed. I look forward to the next stage of the journey, where we move from the south side of the city, to the central and slightly northern areas. Apart from the joy of seeing new things, and getting to know the area in which you live, walking is good for you. It helps to improve the function of the body, but know when to stop. Take heed of the words of Ellen DeGeners, "You have to stay in shape. My grandmother, she started walking five miles a day when she was 60. She's 97 today and we don't know where the hell she is". We often enjoy the walk along the canal from Kinoulton to Hickling. Quiet, quite remote and in places a bit overgrown - but with a pub at each end! I know that you are relatively new to Nottingham, John, and don't know if you have access to transport, but if you do these 2 villages are about 6/7 miles down the road - an easy trip and some lovely countryside.